Video enhancement services is not just limited to surveillance video or police body cameras. Our palm and finger skin have a unique flow like pattern consisting of ridges and valleys. These ridges and valleys help increase friction thereby assisting us grasp objects. Also called as frictional ridges they help enhance the sensing of surfaced textures. This frictional ridge pattern is unique to every finger such that even identical twins can be differentiated on the basis of their fingerprints. As can be seen in the image below, the dark lines represent the friction ridges, while the white space represents the valleys. 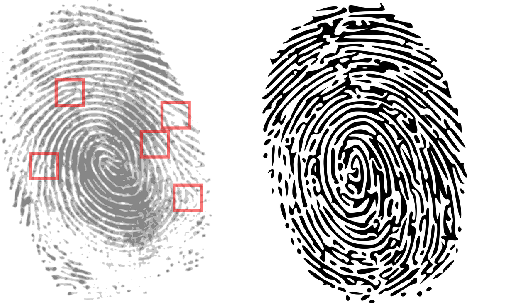 Fingerprint identification is based on the location of ridge ending and bifurcations along a ridge path. It was during the late 19th century that the scientific study of personal identification based on fingerprints received its due importance. Fingerprints are now one of the most widely used biometric format for person identification. 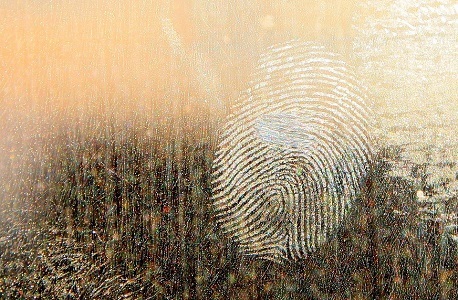 Law enforcement agencies and forensic experts use fingerprints to identify criminals as criminals often tend to leave their fingerprints at crime scenes. This article provides a brief summary of the history, standards and challenges faced in fingerprint recognition. It also explains the video enhancement services available and image enhancement techniques used for fingerprint analysis. Sir Francis Galton, Henry Faulds and Edward Henry are amongst the notable figures that helped establish the scientific basis for using fingerprints to recognize people. In late 1960’s with the advent of computers, a subset of Galton Points also called minutiae, helped expand the science of fingerprint identification. Recognizing its impact on forensic science, in 1969 FBI contracted National Bureau of Standards (NBS) now the National Institute of Standards and Technology (NIST) to automate the process of fingerprint matching. Later in 1975 FBI funded the development of a prototype fingerprint reader and classifier. Over the course of next few years NIST further developed the study of fingerprints and developed the advanced M40 matching algorithm for narrowing the human search. By 1981, 5 Automated Fingerprint Identification Systems (AFIS) had been deployed in USA. In 1999 major components of Integrated Automated Fingerprint Identification System (IAFIS) were operational. By 2003 NIST developed accurate multiple tests under the Fingerprint Vendor Technology Evaluation (FpVTE) which helped evaluate the accuracy of fingerprint recognition systems. Consistent efforts resulted in various standards to standardize the content, meaning, and representation of fingerprint data interchange formats. Standards developed include the ANSI/INCITS 381-2004 Finger Image-Based Data Interchange Format, ANSI/INCITS 377-2004 Finger Pattern Based Interchange Format, ANSI-INCITS 378-2004 Finger Minutiae Format for Data Interchange, ISO/IEC 19794-2 Finger Minutiae Format for Data Interchange, ISO/IEC FCD 19794-3 Finger Pattern Based Interchange Format, and the ISO/IEC 19794-4 Finger Image Based Interchange Format. ANSI NIST ITL 1-2000 Data Format is a standard for the Interchange of Fingerprint, Facial, & Scar Mark & Tattoo (SMT) Information. Electronic Fingerprint Transmission Specification (v7.1) and Electronic Biometric Transmission Specification (v1.0) are specific implementations of ANSI NIST ITL 1-2000 used by the FBI and DoD. Other standards also associated with ANSI NIST ITL 1-2000 are the FBI’s Wavelet Scalar Quantization (WSQ) and Join Photographic Experts Group 2000 (JPEG2000) which are both used for the compression of fingerprint images. Here we are discussing few problems associated with fingerprint recognition. Further research on these challenges can be studied under domains such as video enhancement, image processing, computer vision, statistical modeling, cryptography and sensor development. Rounded shape of fingers, rolling and improper pressure on reading devices cause difficulty in capturing complete fingerprint on touch based sensors. Difficulty in capturing fingerprints on touch based sensors, caused due to dry, wet or dirty finger, cuts on fingers or finger flattening. Overlapping caused due to improper finger placement by user results in overlapping impressions. Altered, fake and latent fingerprints also results in challenges faced by forensic experts. Lack of interoperability due to difficulty in building a single finger recognition system which can be used by all. Short Time Fourier Transform (STFT) Analysis is an image enhancement algorithm which requires STFT analysis and contextual filtering. As a result it also provides an energy map which is used to compute the angular coherence. Pyramid based filtering uses two symmetries to model and extract the local structure in a fingerprint. These two symmetries are called parabolic and linear symmetry. Curved Gabor Filters are used to enhance curved structures in noisy images by locally adapting the shape to a direction of flow. Gabor filters play an essential role in the field of image and video enhancement. Histogram Equalization, Fast Fourier Transform and Image Binarization also involves a two stage process requiring minutiae extraction as the first step and minutiae matching the second. Minutiae extraction includes image enhancement, image segmentation and final extraction while minutiae matching includes minutiae alignment and match processes. Oriented Diffusion Filtering and Curved Gabor Filters is used to enhance low quality fingerprint images. After estimating the local orientation of ridge and valley flow the oriented diffusion filtering is performed followed by locally adaptive contrast enhancement step. Discrete Fourier Transform (DFT) and Histogram Equalization uses a combination of Discrete Fourier Transform (DFT) and histogram equalization to reconstruct the information of the fingerprint image. Coherence Diffusion Filter and Gabor Filter uses a combination of spatial domain two dimensional Gabor filter and diffusion coherence filter.